539 XTF wass a Bedford SB5 with Duple C41F body, and it has been relegated to duty for the Solent Strutters Majorettes group. The registration indicates it was new to an operator in Lancashire in the period 1961 to 1963, depending on the gap between order and delivery (Look, for example, at Lancaster’s 201-203 YTE). We see it in the rally at Netley on 13 July 1986: soon after this it sank to even greater depths with travelers and has since been scrapped. So much is fact, but now we have a question: who was its first operator? 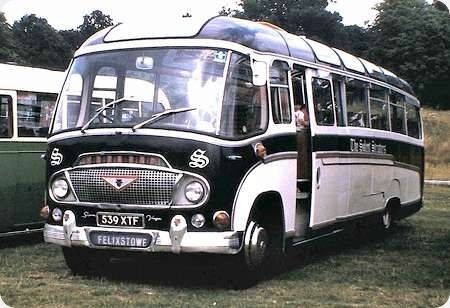 New to Barnes, Rawtenstall, Lancashire in March 1962, along with with 540 XTF. Thank you, David. I did wonder if the first operator might have been Battersby/Silver Grey of Morecambe. They had several of this combination (well, SB if not this model).